LTHForum.com - Can You Kan Pou? LTH Home > Chat > Eating Out in Chicagoland > Can You Kan Pou? I’m not sure how to pronounce the name of this place (I come up with nothing that sounds good), but you’ve probably seen it, if you’ve cruised Western recently. It’s a new place, but the sign looks old. Approved by Seth Zurer and Heather Shouse, the papaya salad was perky and bright, with toothy (?) string beans. It will not rock your world, but it satisfies. I opted for the Broken Sea (I’m a sucker for a good name), which looked nice but had a restrained heat profile. I don’t think Seth liked it. 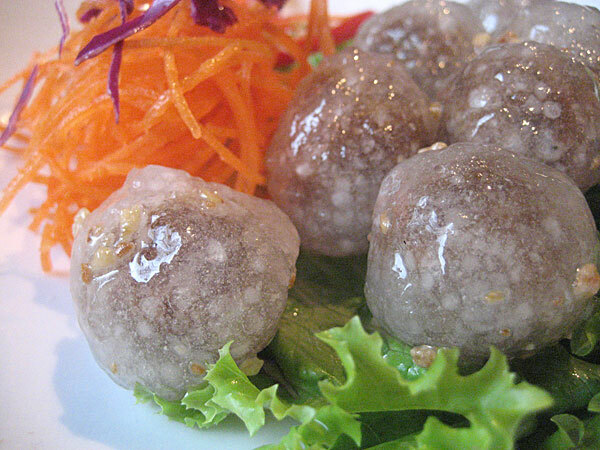 We had some dumplings done several ways, cassava pearls stuff with chicken and turnip, as well as dessert version. 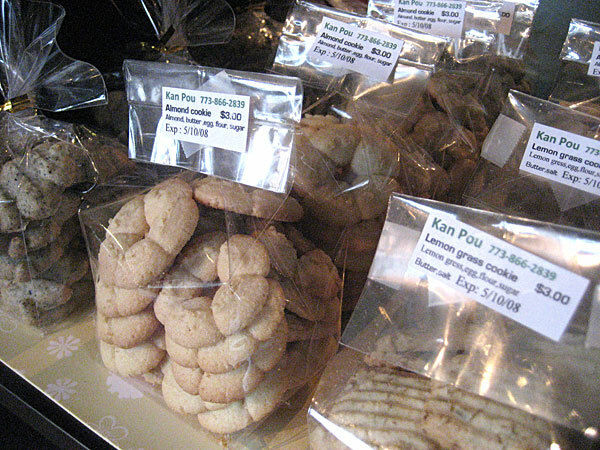 Kan Pou was inspired by a will to bake, and you don’t really expect baked goods at a Thai place (I don’t, at least), but at the end of any meal, I can’t think of anything I’d like more than a cookie…and here, they’re part of the deal. Funny, saw the sign and wondered why it hadn't been mentioned here - because the sign does look like it's been there a while...now I know. Been curious about the "baking" portion of the sign. Thanks for the report, guys! It's pronounced "Gan Poo," according to the owner, Doungpon Morakotjantachote. (Time Out says she's the owner's wife, she said she was the owner to me, anyway, she's clearly the culinary impetus for the place.) It's the Thai word for clove, which is one of the flavors of the cookies, as you may have noticed. I've also had my eye on that sign for some weeks, intrigued by the bakery aspect, and in fact barged into it a few weeks ago with the kids only to find the owner and family sitting there eating their own dinner and the restaurant still a week or two away from opening. As it happens, I too was hobnobbing with other food publications, that is, feeling free in my post-moderator state to pitch a piece to somebody, so I gathered more solidly verifiable info than I customarily would for a post. and more intriguingly, Sakoo dumplings, chicken and sweet turnip mash inside a ball of cassava, the tapioca base used to make bubble tea balls. These had no flavor when you popped them in your mouth, but bite through the gummy cassava to the sweet center and the sweet-savory interior and the texture made them interesting and a hit with the kids. So dinner was nice enough, but we really, really liked the cookies. Doungpon moved to the US about 8 years ago, originally settling in New York. When she moved here she was surprised to not find anyone making traditional Thai cookies, so she started making them to sell at PNA, the little grocery next to Rosded on Lincoln. Eventually she and her husband decided to start a restaurant. The sesame and coconut styles are traditional Thai flavors, but many of the others-- lemongrass and clove-- are her inventions, and those are the ones that really pop with bright and unusual flavors. I highly recommend picking up a couple of bags and surprising folks at the next occasion that calls for cookies. Thanks for posting your excellent pix to this thread. We had these cassava pearls, too, and a version of them showed up on the dessert tray; I think I preferred the savory version, and I can easily see how they'd be kid-pleasing. The people who run this place are very friendly, and it is BYOB, so it makes for an enjoyable and reasonably priced dining option. I suppose it's my skewed perspective showing, but this photo makes me think of "The Blob." Or possibly the opening scene of "Attack of the Killer Tomatoes." The one on the left is leading the attack. "It crawls! It creeps! It eats you alive!" 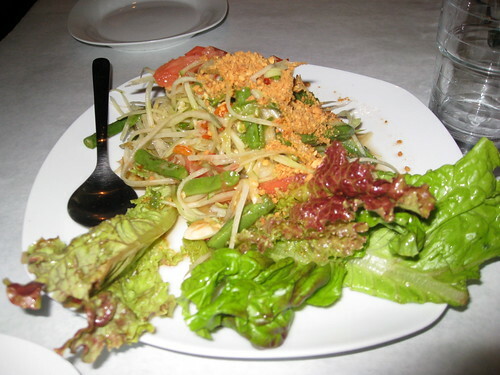 David Hammond wrote: Approved by Seth Zurer and Heather Shouse, the papaya salad was perky and bright, with toothy (?) string beans. It will not rock your world, but it satisfies. FYI, I got Seth's comments first hand; Heather's approval for this dish came via her review in TimeOut Chicago. It's not every day, or even every week, that I get to taste something entirely new to me. So, I was pleased that I finally got around to Kan Pou and tried the other-worldly appearing sakoo dumplings. Delightfully chewy with savory centers, the closest relative that I can come up with are the steamed shrimp dumplings with translucent wrappers found at dim sum parlors. The sakoo might have benefited from a bit of chile, but delightful nonetheless. I enjoyed our beef salad, but left a little underwhelmed by the main dishes, specifically the fried fish in chile sauce. Overall, the menu seemed dominated by Chinese-style Thai with a few curries and noodle dishes. Nothing in the main dish department really jumped out to me as interesting or exciting. But there were plenty of small dishes listed and I certainly wanted to try more. The cookies are delightful and deserve a lot of praise. 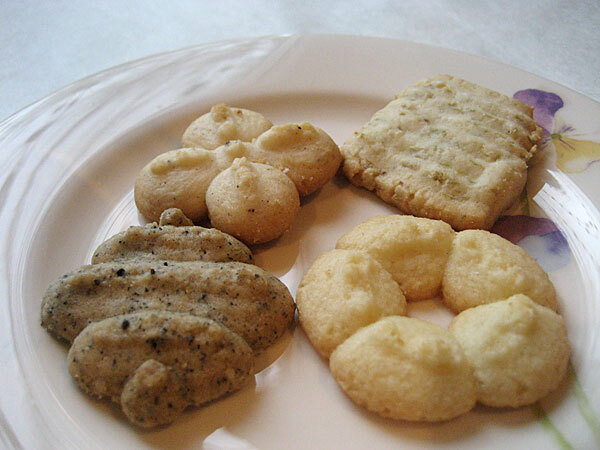 These are butter cookies for the adult palette, with delicate, understated flavoring. I enjoyed the ginger cookie very much and we took home a bag of sesame cookies. The hosts of Kan Pou are warm and friendly, the space is attractive, and between the sakoo dumplings and wonderful little cookies there's more than one reason to drop in for a visit. I'm sure there are more little gems in that kitchen. I hope a few more people stop in to check it out soon. (It was dead empty at peak Saturday night dinner time). We headed to Elephant Thai to dine for the first time tonight and when we arrived at 9:00 it was closed. On a whim we decided to try Kan Pou which I have driven by many times and wondered about. We are partial to TAC Quick and my partner is reluctant to stray from the tried and true but we ventured on. We arrived at 9:15 and the place was empty save for the server, the owner/owner's wife (according to previous posts) and a young girl in pajamas. We had a very pleasant meal. I had the pad thai which earned 100% for presentation. It arrived in a mound on my plate encased in a scrambled egg basket weave. I wish I'd had my camera to take a picture, it was beautiful. 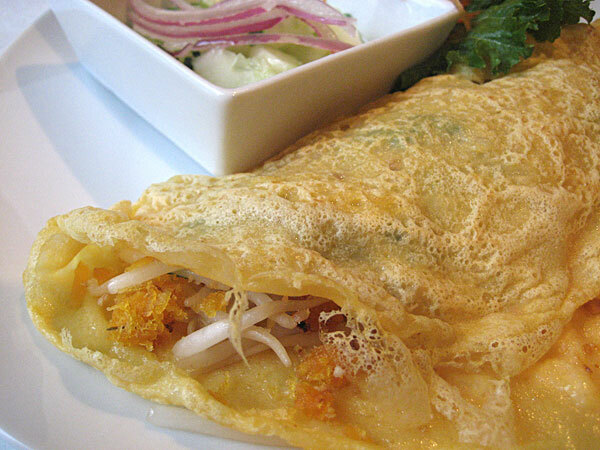 I really like when Pad Thai is served with a lime wedge and this version arrived with a generous wedge. Good thing too because the dish, although cooked perfectly, was a bit sweet. I doused it with lime juice and a bit of hot sauce that I requested and fully enjoyed the dish. My partner had basil chicken which he ordered spicy. 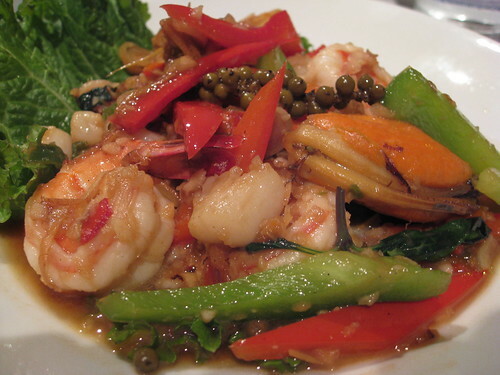 It could have been spicier but it was the freshest version of this dish that we've had. It was also plated beautifully and had a beautiful serving of fresh thai basil on top. The complimentary cookies we received were sesame and chai. A nice ending to a pleasant meal. We complimented them on the way out and they gave us a take out menu which included great coupons including buy one meal get second free (dine in) Sun-Th. Sign on door says delivery will begin soon and they have a large delivery radius. That dish is their Red Wing appetizer—a chicken wing preparation like I've never had before. Red Wing appears to be a Thai-ization of Buffalo wings, trading out the red hot sauce for Sambal Oelek sauce and fried thai basil. It is tangy, spicy, and delicious. At $6 for 4, maybe 5 wings it is a bit pricey, but worth it IMHO... although I'd recommend getting it there instead of through delivery as it seems to taste better when served immediately. KugelMonkey wrote: At $6 for 4, maybe 5 wings it is a bit pricey. Are you describing whole wings or are they cut into drummette and wing portions? That makes a bit of difference in the pricing for me. They are cut into the drummette and wing portions, you don't get four of five entire wings. 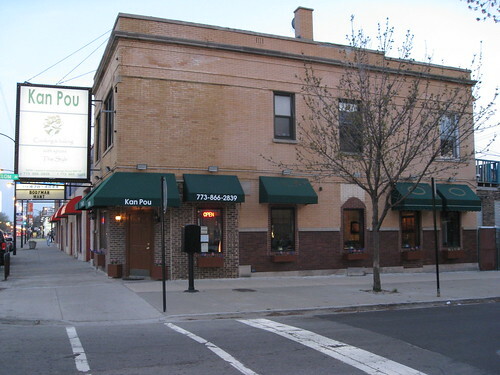 Western Avenue between Irving Park and Lawrence could be a very dangerous place to open a Thai restaurant, being so close to Spoon, Sticky Rice, Rosded, and other popular Thai choices. 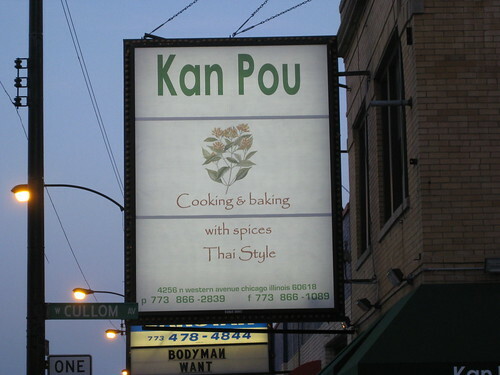 But Kan Pou opened about a year ago and is still around so maybe they're doing something right. But my first taste of Kan Pou a couple of days ago was not so impressive. I tried pretty standard stuff: crab rangoon, pad see ew and jungle curry. The crab rangoon was fried at too low a temperature, leading to a greasy mess. The pad see ew included fried egg, but the egg flavor was a little off. The dish was also a bit overpowered by nam pla. As for the jungle curry, we ordered it "extra spicy," but not only was it not the least bit spicy, it was also lacking in flavor. Others seem to have had more positive comments about Kan Pou, so maybe I just ordered the wrong items or hit them on a bad night. But with some of my favorite Thai spots only a short walk away, I doubt I will answer these questions myself. In the mood for something sweet after a great dinner at Spoon Thai, I stopped at Kan Pou for some cookies. Got the "Thai Tea" flavored ones, and they were good. The tea flavor was restrained, so what stood out was the taste of a fresh butter cookie made with good ingredients. It hit the spot, but 3 bucks is a little much to pay for a tiny bag of butter cookies, so I probably won't return for that. 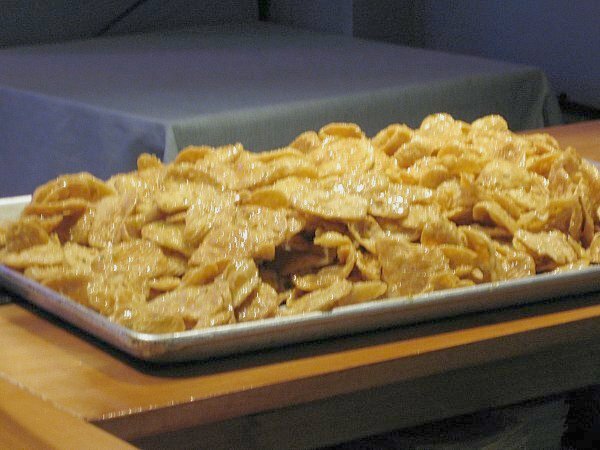 More interesting to me was the giant tray of "chips" set out on the bar, being gobbled up with byob beers by a seemingly happy group of Thai people. Still slightly warm from the fryer, these were basically just a deep fried flour-based dough with sugar, garlic and cilantro. A little sticky to the touch, with a pleasant sweet/ savory thing going on. An excellent beer or bourbon snack. It almost seemed like these had just been put out for staff and friends of the house, so I have no idea if/ how one can purchase them. I'm sorry to say I called Kan Pou today to place an order, and there was a message saying they are no longer in business. The message also said there would be a new tenant July 1st. I'm sad about this - it's one of the places I always intended to visit more regularly. Wow, I just walked by it the other day and it appeared to be functioning, and I thought geez, I should try it.